After four years of escalating violence and rising displacement in Yemen, the scale of the world’s worst humanitarian emergency cannot be ignored. The humanitarian crisis in Yemen is the worst in the world, driven by conflict, economic collapse and the continuous breakdown of public institutions and services. Children in one of the Child Friendly Spaces (CFS). Raising awareness activities with migrants. IOM started operating in Yemen in 1994 when the organization assisted in evacuating migrants from Aden stranded during the civil war. The government of Yemen has been a member state of IOM since 1999 and a first status agreement with the government was signed in 2001. IOM has worked closely with the Ministry of Expatriate Affairs on Yemeni migrant communities abroad and/or returning to Yemen; it continues providing transportation assistance to migrants stranded in Yemen and victims of trafficking in conjunction with Immigration authorities. In 2006, counter trafficking technical assistance was provided in Haradh in coordination with UNICEF to build the capacity of shelters for Yemeni minors. In 2007, an IOM Office was established in Sana’a to work more closely in assisting stranded migrants. The 2001 status agreement was further ratified by the Ministry of Foreign Affairs (MoFA) in 2013. In addition to the mission in Sana’a, two IOM sub IOM-offices operate in Aden and Hodeidah (the latter was moved from Haradh in 2015 because of the conflict). There are three IOM Migrant Response Points - in Aden, Bab Al Mandeb, and Hodeidah - to address the immediate needs of vulnerable migrants. IOM field teams operate and have local presence in 15 governorates. In 2016, the UN estimated that over 107,000 migrants and refugees came from the Horn of Africa to Yemen, despite wide scale conflict. Most migrants hoped to reach a Gulf country; however, increasing numbers saw Yemen as a potential destination country as well. IOM Yemen aims to protect and assist vulnerable migrants on a case-by-case basis through the provision of food, non-food items, temporary shelter, medical and psychosocial support, information, etc. In 2016, more than 21,000 migrants received from IOM multiple forms of humanitarian assistance and protection support. A thorough screening by IOM identifies migrants’ specific vulnerabilities and enables IOM to provide customized response based on the migrants’ informed consent. This includes 2,580 migrants who wanted IOM evacuation support by air or sea to escape Yemen’s crisis. IOM has been a major actor in the fight against human trafficking, cooperating closely with civil society and government partners to support Yemen’s activities that raise awareness, strengthen the institutional response, protect victims and prosecute human traffickers. In 2016, IOM identified 27 victims of trafficking, who were mainly child migrants. Yet, because of the protracted conflict, emerging trends of human trafficking among the Yemeni population are disconcerting. Many children in Yemen have dropped out of school, are forced to beg on the streets, have been recruited to fight in the armed-conflict, and be married at young ages. These issues can become stressful for the child and family to manage, and manifest into serious psychosocial needs. While the current scale of human trafficking in Yemen, particularly among the Yemeni children, is unknown, anecdotal information is being brought to the attention of child protection partners like IOM, necessitating increased prevention and protection activities in order to mitigate the risk of children and other vulnerable persons. In 2016, IOM Yemen established Child-Friendly Spaces that are designed to mitigate the effect of the protracted conflict on children, their families, and the larger community. More than 100,000 conflict‐affected Yemeni children benefitted from a range of psychosocial support and community engagement activities at 31 Child-Friendly Spaces at parks, schools, orphanages, and special centres in Sana’a and Aden. In addressing internal migration challenges in Yemen, IOM is active in the field of emergency and post-conflict response management by providing emergency assistance to displaced, returnee, conflict- affected and migrant communities across Yemen and in particular in remote and underserved governorates. In May 2014, conflict between the Government and armed groups in Abyan (Mafhad district) and Shabwa governorates resulted in the displacement of hundreds of families. Furthermore, due to access constraints, Abyan’s North-Eastern districts and Shabwa governorate have been largely excluded from humanitarian support; however, IOM has delivered substantial livelihood support as well as the provision of shelter and non-food items to IDPs who have returned home. IOM is extending emergency assistance to conflict-affected and displaced persons in Al Dhale and Hadramaut governorates in southern Yemen as well. IOM’s emergency interventions seek to facilitate safe and sufficient access to water, sanitation and hygiene, shelter, essential non-food items and health services. Continued life-saving assistance will be essential to support vulnerable communities in these areas. IOM continues to provide emergency relief to affected populations in Yemen’s northern Al-Jawf governorate through WASH, shelter, livelihood and NFI activities in target districts and has expanded the geographical scope of emergency programming to further assist vulnerable displaced populations and host communities. To build the resilience of affected communities to future shocks and crises, IOM delivers technical expertise and productive inputs and equipment in support of agriculture, fishery and pastoral activities with the aim of enhancing small-scale livelihood activities in displaced and conflict-affected communities. IOM activities promote income generating opportunities for women headed households through the provision of in-kind support for micro businesses. These interventions seek to rehabilitate basic services and infrastructure affected by widespread displacement and destroyed by conflict. IOM Yemen delivers emergency healthcare assistance to both Yemeni communities and migrants affected by conflict, displacement and forced migration in Abyan, Alhudaydah, Al-Jawf, Aden, Hajjah, Lahj, Shabwah, Taizz and Sana’a governorates. Through its Migration Health Programme (MHP), IOM Yemen responds to the lifesaving and long-term health needs of these populations and through a comprehensive approach, including direct provision of medical services; facilitates access to health services for vulnerable communities and access facilitation to migrants, capacity building; advocacy; assessments and awareness campaigns. IOM operates mobile medical clinics and manages outreach teams active in Abyan, in addition to providing financial and technical support to permanent health facilities that serve to increase health care coverage for vulnerable and conflict affected populations; as well as to ensure sustainability of IOM health activities. In Al-Jawf, IOM provides medical assistance to the most affected and underserved communities through complete primary health care services and health awareness activities. IOM also works closely with health institutions in Al-Jawf to support nutritional programmes and vaccination campaigns for children in need. In Hajjah, IOM operates two established health clinics located in Haradh City and at the Al Tuwal Port to provide life-saving medical assistance to stranded migrants and Yemeni migrants returning from Saudi Arabia. IOM also manages a health clinic in the Immigration, Passport and Naturalization Authority (IPNA) in Yemen’s capital city Sana’a, and another clinic in Aden, located in Aden’s impoverished neighborhood of Basateen where large numbers of migrants are present. Additionally, IOM operates five mobile emergency teams along Yemen’s south-west and western shore, identifying and assisting vulnerable, sick and injured migrants upon their landing in, and during their journey throughout Yemen. IOM works with partners through inter-agency coordination for the enhancement of medical relief efforts while also building the capacity of Yemen’s Ministry of Public Health and Population. IOM Yemen delivers technical support on data and border management with a view to increasing the capacity for the government of Yemen and civil societies to address mixed migration challenges and foster effective and humanitarian migration governance practices. Within a portfolio of capacity building activities, IOM delivers training and workshops to government ministries, institutions and coastguards on topics such as border security, referral and registration, and documentation. In addition, IOM helps the government of Yemen establish/refurbish government-run migration reception facilities. IOM Yemen provides technical advice, supports the development of national policies and legislation, and facilitates regional dialogue on issues concerning labor migration and the nexus between migration and development. IOM also conducts research on topics including the role of the Yemeni diaspora and labor mobility. Given its unique geographic position, Yemen is a receiving, transit and sending country for labour migrants. As such, IOM is a key partner in assisting the government of Yemen to promote safe labour and migration practices for Yemenis and third country nationals. IOM is also involved with assisting the government of Yemen with voluntary and dignified return of migrants to their countries of origin and the reintegration of Yemeni returnees. The Kingdom of Saudi Arabia’s (KSA) domestic labour market restructuring efforts resulted in massive returns of foreign migrant workers throughout 2013. In 2013, IOM began monitoring the daily flow of Yemenis returnees and providing humanitarian assistance at the Al Tuwal land border-crossing in Hajjah governorate. IOM continues to provide humanitarian assistance to the more than 1000 returnees who cross into Yemen each day. 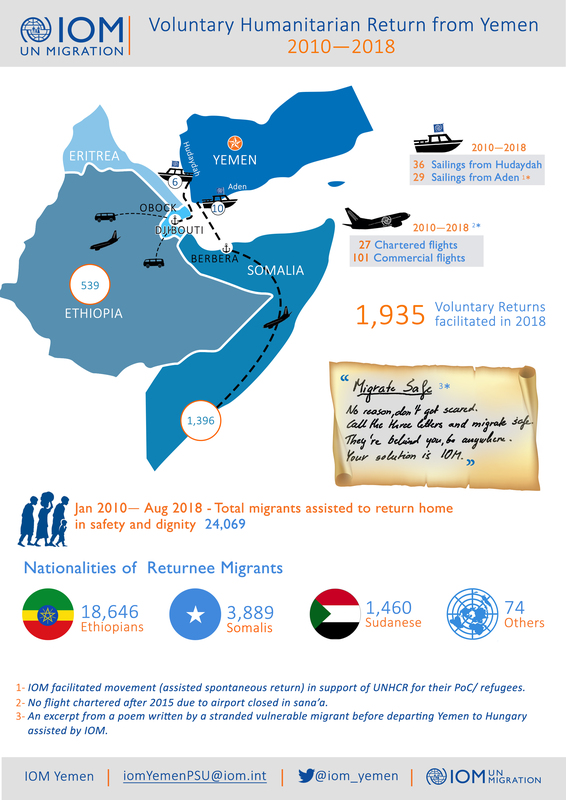 As the leading inter-governmental organization working with migrants and governments to respond to contemporary migration challenges, IOM assists the government of Yemen in embracing a holistic and long-term approach to managing migration flows. IOM Yemen continues to pursue the recommendations of the Sana'a Declaration, an outcome of the Regional Conference on Asylum and Migration held in Sana'a in November 2013. This is aligned with of IOM’s primary strategic priorities which are to strengthen governmental capacity to monitor and manage migration flows through effective policy making, policy dialogue, information sharing and cooperation.